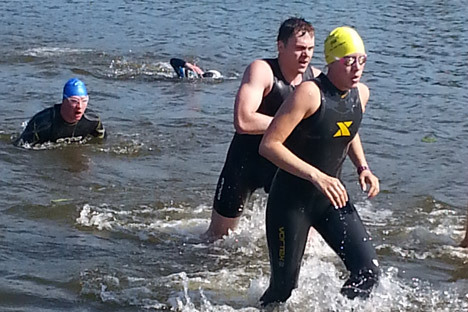 Want to do an aquathlon in Russia? Be prepared for a mid-morning start, runners in speedos and a very fast crowd. Given my experience with road races in Russia, as I stood around after transition closed at the Transcendence Aquathlon in Moscow on July 6, I was trying my hardest to find people who might fit in this last category. I had one goal for the morning: to not finish last. As I stood there, I chalked up a few more differences between races in Russia and races in the U.S. For one thing, the overall level of fitness of the participants was far higher here, further reinforcing my belief that people who do this kind of thing in Russia are serious and not just people with a weird hobby. Then, despite the water being a rather cool 68 degrees, very few people were wearing wetsuits. In the U.S., the general rule is that if the race is wetsuit-legal, you wear a wetsuit. Here I didn’t know if the lack of wetsuits was because 1) the water was pretty warm for Russia; 2) wetsuits slow you down in transition or 3) wetsuits are for wimps. Most of the field was content with just their speedos. These were not the only differences I noted that morning. Multisport races in the U.S. involve getting up at 3 a.m. and hiking through some muddy field at a state park to a race site easily located by its excessive floodlights and blaring Bon Jovi. Multisport races in Russia involve a leisurely breakfast at home and a trip on a mini bus to a nice public beach where the music selection would be perfectly acceptable for a yoga nidra class. While the process of picking up your race number and timing chip is much the same in both countries, in Russia, there is an additional step in the registration process: Participants have to present a medical certificate issued and stamped by a doctor saying that they are healthy enough in principle to swim 1 kilometer then run 5. In the U.S., participants just sign a paper saying that they realize multisport is inherently dangerous and they might die, but their willingness to make stupid choices isn’t the fault of the race organizers. The other major difference with multisport races in Russia, as in road races, is the size and gender distribution of the field. Of the 180 people registered for the aquathlon, 30 of them were women. A full half of the participants were men between 18-40. According the USA Triathlon, the largest group of age-group triathletes in the US - 30 percent of all USAT members – are people between 40-44. Women make up nearly 37 percent of USAT members. Overall my first multisport event in Russia was a good experience. And by that I mean that I did not come in last. Actually I came in 96th overall, and third in my age group – an accomplishment I was happy to trumpet to the world, conveniently neglecting to mention that I was third in a field of six. I also failed to note that I came in behind not one, but two competitors who had only one arm. In a race that involved a 1km swim. Now, the only thing left to do is buy a bike.